Children use games for entertainment and to learn basic skills, and general knowledge gaming incorporates both fun and the ability to explore new information. Game-based learning pits kids against others or sets a basic standard to meet when children play the game alone. Gaming, according to the Science Education Resource Center at Carleton College, blends interest with learning and encourages children to learn from the mistakes made while playing or sharing strategies with family members and friends. Quiz games integrate questions about general knowledge with strategy skills to move tokens around a game board or manipulate interactive game pieces either on a game board or computer monitor. Game makers design trivia questions to the reading level of the children and manufacturers note this on the packaging. Buy the appropriate level for your child's ability to avoid frustration or lack of interest in the knowledge game. Review the packaging to make sure the rules also match your child's skill level. Word knowledge games feature paper and interactive media puzzles, including crosswords, word searches, phrase matching and hidden-message games. Games that integrate letter tiles teach children the power of words and how letter manipulation creates new words. General knowledge games using letters sometimes feature dice with lettered sides that ask kids to make words from the random display tumbling from the dice holder. Early letter games for toddlers attach single letters to blocks or toys for manipulation, although the games rarely involve score keeping for the young players. 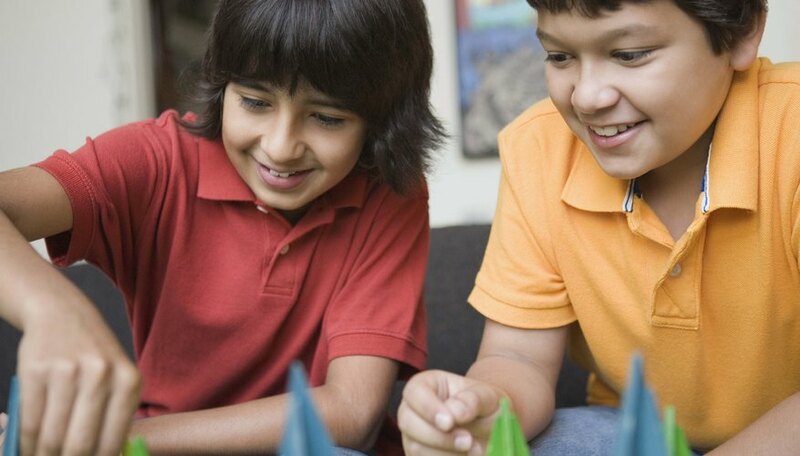 Math puzzles such as number blocks, code games and math squares offer methods to teach kids general knowledge on paper or during media gaming. Math-oriented games introduce general math skills and the simplest focus on elementary addition and subtraction. Cribbage integrates a score keeping board and playing cards and uses math combinations of the numbers of 15, 29, 30 and 31 to play. Kids quickly learn to identify cards matching those sums. The Science Foundation Center at Carleton College recommends picking games that have the capacity to expand as your child masters the basic play. Demonstration games use the theory of constructivism to teach children general knowledge about how things work, and introduce kids to the concepts of designs and patterns. The education theory supports the philosophy of active learning, and uses demonstrations to tie known things to new learning experiences. Some demonstration games teach basic biology concepts in a fun way by asking kids to remove play organs during an operation on a cartoon figure. Games sometimes ask kids to construct towers or elaborate structures to teach the concepts of balance and planning. Children without reading skills have a choice of games that ask players to manipulate pictures or letters. Matching games incorporate a collection of images attached to tiles or printed on cards, and these teach children how to evaluate general characteristics. Kids use observation skills to learn typical traits, such as cats have whiskers and fish sport fins. Picture games also integrate geography to teach kids to identify the homelands of animal species, including rain forest fish and animals. Alphabet image games offer practice for preschoolers to help master language skills. Thirteen Ed Online Concept to Classroom: What Is Constructivism?